Tobi joins Akatsuki after Sasori's death, taking his ring, position, and partner (Deidara). Tobi's personality is at odds with the standard amongst Akatsuki members; while most are dedicated and serious, Tobi is more carefree and goofy. These personality traits tend to irritate Deidara, who often attacks Tobi in a comical fashion whenever Tobi unintentionally annoys him. Kisame Hoshigaki, on the other hand, appreciates Tobi's ability to brighten up their "gloomy organization". After Tobi's encounter with Sasuke Uchiha, he is shown giving orders to Pain, until then the ostensible leader of Akatsuki. During their conversation, he refers to himself as Madara Uchiha. Madara created Akatsuki as a means to hide himself from the world, using their activities to disguise his own plans. As Madara, Tobi's personality and speech become completely different, with much less formal diction and a more typically 'villainous' arrogance. It seems, however, that he still has some vested interest in maintaining the illusion of himself as the carefree Tobi, as he reverts to this personality upon encountering a group of Konoha ninja. Tobi's actual appearance remains a complete mystery, except for a wild shock of black hair. 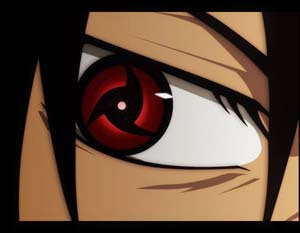 He wears an odd mask that covers his entire face save for his right eye, which like other Uchiha has a Sharingan. He also has several bolts or pins present on the arms of his uniform, now obscured by his Akatsuki cloak. Furthermore, Tobi does not wear a visible headband, though Madara Uchiha is known to originate from Konohagakure. His fighting style is equally shrouded in mystery, as his only notable trait is the ability to let attacks pass through him and to withstand normally fatal blows.